It is helpful to boost the efficiency of crop oriented genetic programming by using gene editing technique to delete unfavorable gene and improve the target characters accurately. Benifit from its convenient, accurate and multi-targets gene editing function, CRISPR/Cas9 has successfully applied in plant genes to improve the phenotypic characteristics against insect pests and drought. It is expected to be widely used in precise genetic improvement of crops. Precise plant gene editing has been listed as one of the ten major scientific and technological breakthroughs in 2016. 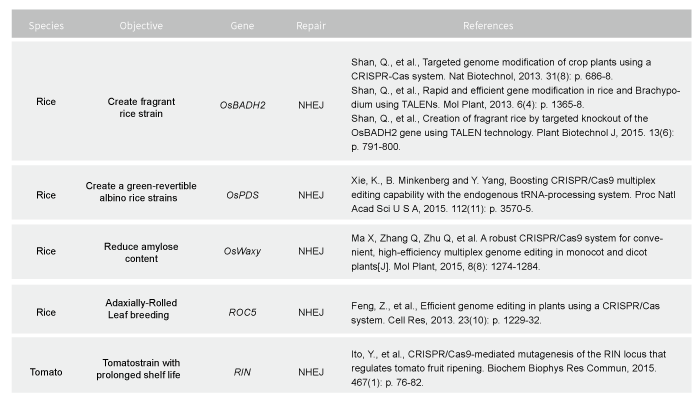 The targeted gene engineering based on CRISPR-Cas9 has gradually replaced traditional plant breeding and genetically modified organism (GMO) methods to improve crop characteristics to ensure thesustainable production of crops. Synbio Technologies provides complete solutions from sgRNA design, Cas9 codon optimization, sgRNA and Cas9 synthesis and constructionto activity detection. Synbio Technologies’ patented sgRNA design software provides efficient and accurate designs for multiple species. Optimize Cas9 protein to ensure its efficient translation in plant cells.